The death of a political figure in the United States of America is always a time of sorrow. The more prolific the figure is, the more of a wave of sadness shoots through the nation. That is exactly why the country was shocked and depressed over the murder of Robert F. Kennedy. 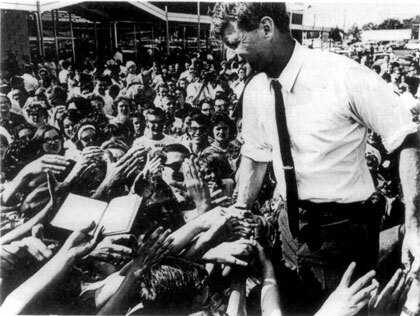 Kennedy was expected to become the next President of the United States when he was murdered over forty years ago. Sirhan Sirhan was caught with the gun in his hand when Robert F. Kennedy was shot on the night of June 4th, 1968. The popular Democrat would fight for his life for 26 hours before finally succumbing to the wounds on June 6th. Kennedy, who was the brother of the assassinated President John F. Kennedy whose death is still mysterious to this day, had just been elected the choice of California for the Democratic candidate for the upcoming Presidential election. Sirhan was at first sentenced to be put to death for murdering the man who was on his way to potentially becoming the President of the United States, just like his brother did. In 1972, he was told that instead he would serve life in prison. Prior to the announcement, the death penalty was deemed unconstitutional in the state of California. Since he was sentenced, Sirhan has set his sights on finding a way out of jail. As of now, he has officially petitioned for parole a grand total of thirteen times. The 66-year-old man stood in front of the Board of Parole Hearings located at the Coalinga, California Pleasant Valley State Prison on Wednesday. He stood there and listened to them reject his request to be a free man once again. Pepper says that Sirhan does not deserve to spend another day in a prison cell and that he has paid his debts. Whether or not people feel that Sirhan has paid his debts by spending four decades behind bars, it is not to be overlooked that his actions highly impacted the landscape of American politics by taking out a major candidate. In five years, Sirhan can request parole again.